The "ADI" line of hydraulically powered hand tools offers a full range of loppers, chain saws and disc saws, for agriculture and line clearing industries. Years of know-how and field experience are behind the "ADI" tools. They have a patented unique hydraulic system, and are backed by fine engineering, manufacturing, testing, spare parts and technical support. 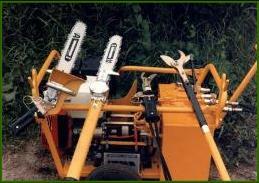 "ADI" tools combined with our AFRON line of pruning platforms help users around the world to improve job efficiency, save time and money.